Jean-Pierre Piat features in Napoleon in America because of his involvement in a Bonapartist plot against the government of Louis XVIII of France. In real life Piat was a courageous French soldier and devoted Bonapartist who was viewed with suspicion by the Bourbon regime. Late in his life Piat helped Napoleon’s nephew, Louis-Napoleon, rise to power after the 1848 French Revolution. Jean-Pierre Piat was born in Paris on June 6, 1774. By January 1792 he was a sub-lieutenant in a French infantry regiment. He started out with the Army of the North and quickly earned a reputation for bravery. Piat subsequently fought in Italy and in Egypt, where he was shot in the face during the siege of Cairo and received another ball to his right knee during the Battle of Alexandria in 1801. Piat returned to France, then served in Italy, Spain and Germany, rising through the ranks and suffering a number of wounds. After Piat’s skilled performance at the Battle of Wagram in 1809, Napoleon made him a Baron of the Empire. Piat fought in the Russian campaign, and then in Saxony. In April 1813 he was promoted to the rank of general. Put on inactive service during the First Restoration, Piat rejoined the Army of the North in March 1815, after Napoleon’s return to Paris. At the Battle of Ligny, on June 16, 1815, General Piat was badly wounded when his horse was killed underneath him. Following Napoleon’s 1815 abdication, Jean-Pierre Piat was again placed on inactive service (see my post about the demi-soldes). A known Bonapartist, he was under close surveillance by the Bourbon regime. In March 1823, Piat was arrested with two companions on his way from Bayonne to Bordeaux on suspicion of being the ringleader of a plot to subvert French soldiers on the Spanish frontier. He was released and no further action was taken against him. In April 1824 he retired from the army. 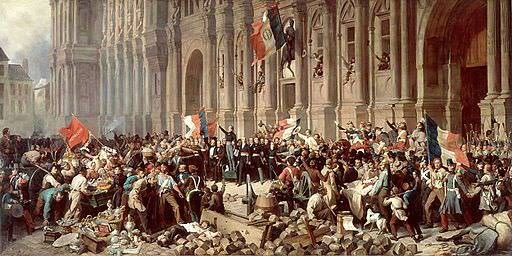 The July 1830 Paris Revolution, which ejected Charles X from the French throne and brought Louis-Philippe to power, marked a change in Piat’s fortune. In March 1831 he was taken out of retirement and given command of the subdivisions in the department of Var. Two years later he moved to a similar post in the department of Hautes-Alpes. In 1837 Piat retired, apparently due to his age. He moved to Nogent-en-Marne. The French Revolution of 1848 gave the then 74-year-old Piat yet another chance to serve the Bonapartes. Piat was one of the organizers of the Society of December 10, which advanced the cause of Louis-Napoleon (son of Napoleon’s brother Louis), who was elected president of the Republic of France on December 10, 1848. Piat helped to found newspapers, including Le Napoléonien, designed to spread Louis-Napoleon’s ideas and increase his popularity. Louis-Napoleon, who became Napoleon III, rewarded Piat by making him a senator on March 27, 1852. Jean-Pierre Piat served in the Senate until his death on April 12, 1862, at the age of 87. He is buried in the cemetery of Saint-Maurice (formerly Charenton-Saint-Maurice), which is now part of the southeastern suburbs of Paris. Guy Delavau and M. Franchet, Le Livre Noir de Messieurs Delavau et Franchet, Vol. III (Paris, 1829), pp. 349-351. Edward Roth, Life of Napoleon III (Boston, 1856), p. 333. This devoted adherent, at the first news of the abdication [of Louis Philippe], had run to the Hotel de Ville to defend the rights of the imperial family; but instead of making himself heard, he had been almost torn to pieces by the furious republicans, who dreaded the influence which the great name still possessed over the popular mind.